Ah, the utterly alien feeling of opening my home page and clicking on ‘create new entry’. We all know the adage ‘time flies when you’re having fun’, but not many of us know its corollary: ‘time also flies when you have more things to do than time to do them in’. That second part is the only way I can explain how five and a half weeks have passed since my last post, since if there was fun involved it certainly kept itself well hidden. But never mind about the fun, the important thing is that the work somehow got done. Technically the thesis is still not quite finished, but it is close, and you’ll be glad to hear that despite the last niggling bits, I am determined that it will have as little impact on my cooking, eating or blogging as humanly possible from now on. Oh, and before I forget, thank you all for the avalanche of luck you sent my way. It seems to have done the trick. So what does a panicked, exhausted, house-bound thesis writer cook for herself? I certainly never forgot to eat (as Nicky will be glad to hear), but something about staring into a computer screen until my brain bleeds just saps away the motivation for cooking. Most nights, in fact, when I finally tore myself away from the thesis all I could do was sit slack-jawed and glassy-eyed in front of the television, and whatever made its way onto my plate was fine as long as it didn’t require any effort on my part. I certainly appreciated good food when it appeared before me – Manuel, for example, had the chance to flex his culinary muscles a few times and took advantage of every opportunity to whip up his secret family recipe for spaghetti bolognese (I’ve never been able to confirm it, but I do believe there’s some curry in there…). But alas, he also spent a good part of the month in Germany and when he was gone, I had to fend for myself. Not having the time or energy to even light the stove most nights, I learned the hard way how easy it is to get into a habit of eating easy, nutritionally-dubious food. If I had the strength to make it to the store I could be found scarfing down tasteless meals-on-a-tray and refrigerated pizza; if I didn’t, you would have found me around dinnertime plating up everything from ice cream with a side of cheese sandwich to chocolate-flavored oatmeal (which in itself was an exciting change from the plain oatmeal I’d had the previous two nights). At a certain point I realized, though, that as important as this thesis is, it’s not worth compromising my general well-being over, and so I quickly decided I was going to have to come up with a new plan. I needed something quick, tasty and healthy, that preferably would engage me in actual preparation mode only once every few days. Enter chickpea chaat salad. This marvel of a bean dish had all I needed and more. Not only was it quick to whip up and lasted for days in the fridge, but it had everything I required to keep me going: protein from the chickpeas, carbohydrates from the fruit, and plenty of flavor from a beguiling mix of spices, chile, tamarind, and cilantro. Chaat, in case you’re not familiar with the term, actually applies to a whole category of snack foods in India that combine something starchy (usually potatoes or pieces of fried batter) with fresh vegetables, spices, fiery chilies and a souring agent such as lime, tamarind or yogurt. In India you would buy chaat in a million different variations from street stalls, and every region has its own typical offerings. Bombay, I recently learned, is widely regarded to be the center of the Indian chaat-universe, with hawkers on Chowpatty Beach dishing up every combination of salty, crunchy goodness under the sun. The thing that sets this particular chaat in a league of its own, at least as far as I’m concerned, it the inclusion of fruit. While the few chaats I’ve eaten previously have all been delicious, the little unexpected nuggets of sweetness in this one add that extra dimension that literally pushes this riot of flavors over the edge. The banana, in particular, is a great substitute for the more common potato. I wish I could claim credit for this innovation myself, but actually I was given the idea after trying the unusual version on offer at our favorite local Indian restaurant, where the combination of vegetables, banana and spices goes by the name Simla chaat (after the stately Himalayan hill town, I assume). I don’t know if everyone in Simla adds banana to their chaat, but if they don’t, they should – it’s fantastic. Though I certainly appreciated the convenience, flavor and nutrition this chaat provided to fuel those long, dark hours of work, I realize now that the best thing about it is that somehow it just keeps getting better with each and every meal. It may not be part of any accepted thesis-writing methodology, but for me it sure seems that a little jolt of deliciousness goes a long way toward coaxing out every last stubborn drop of academic brilliance. Then again, I suppose we’ll have to let my examiners have the last word on that. Notes: To make this dish you’ll need to track down one specialty ingredient, the chaat masala. You should have no trouble finding it boxed alongside other spice mixes in Indian grocery stores, but if you can’t you can try your hand at making it yourself (assuming, of course, you can track down the spices you need). Other uses for this delicious salty-sour-pungent powder include sprinkling on pakoras, roasted potatoes and even nuts. A recipe to make it yourself can be found here. Heat the oil in a large nonstick skillet over medium-high heat, then stir in the garlic, ginger and green chilies, stirring until fragrant and golden, about 30 seconds. Add the ground coriander, 1 1/2 teaspoons of the chaat masala, half the cilantro, and stir about 30 seconds more. Add the chickpeas, water and tamarind, and cook, stirring as necessary, until the chickpeas are tender and all the juices evaporate, about 5-7 minutes. Transfer to a bowl and let cool. When completely cool, stir in the cucumber, remaining fresh cilantro, scallions, banana, and remaining chaat masala. Sprinkle with the pomegranate seeds just before serving. Best served cold or at room temperature. Fabulous, Melissa!I’m glad to see you back to blogging and wish you well the final touches to your thesis.I myself have never tried chaat but the idea of adding fruit sounds most inviting! Never heard of this. Thanks for sharing! It sounds wonderful. Hi Melissa, I am new to your site I saw it listed on food s’cool as an example of compelling graphics that make one want to stay and read. It is beautiful all in all and I look forward to reading and being inspired. Bravo, Happy one year anniversary and congrats on the thesis! I sure know what you are going through but keep it up! Great recipe, I’ll have try it soon! Well hello darlin! Glad to see you back and the answer is yes, I am definitely craving a chaat.. I love chickpeas and the colours in this salad are so lovely. I’ve recently purchased my first bottle of tamarind paste so I’m looking for ways to use it. Plus, if this recipe will help my brain work better, how can I not make it? Welcome back, Melissa! This salad looks lovely, do you think I can have a go without bananas? This is not something I would normally eat, but I can’t stop staring at the photo and thinking about all the great flavors…this might just get me over my dislike of chickpeas! Melissa,Good to have you back. Wonderful to have you back, Melissa!This recipe sounds delicious and looks gorgeous. Pomegranate season has long since ended here in Toronto, but there’s always next year!Happy blogging, and best of luck with the rest of your thesis! I’m not big on bananas, but I just removed them from the recipe and it was delicious. My coworkers thought so too! Thanks for yet another inspiration. An excellent addition for my collection of meals-which-fit-in-a-bowl. Everyone should have several full meal favorites in this category, which can be taken with you all over the place, and consumed with a single spoon.I see myself packing this for lunch at work, too. I’m going to stop at the Indian market and look for chaat masala.Glad you’re back-missed you! Well, Hello again. So glad to have you back again Melissa. Congratulations on the thesis progress.Chaat looks beautiful and good enough to eat night after night. Looks like just the best kind of summer salad. I’ve just been discovering fruit in salads is really terrific and it looks like a winner in this one.So glad you’re back! Melissa, great to have you back!without knowing it, I made something similar to a chaat last week. I mixed cooked chickpeas with a little bit of a gingered-spicy kofta sauce based on tomatos, a little bit of tahini and pomagranate concentrate (I think it’s called pom. molasses?) instead of lemon juice to provide a bit of sourness.it came out fab.my question is: can tamarind be replaced with pomagranate molasses? Welcome back. Good to know that most of your thesis is done. S still has a long way to go to finish hers — but she has just a few weeks to cover that distance. The recipe, as usual, sounds great and looks fabulous. Hi Paz – Yes, it is *such* a relief to have most of the work done now, I feel like an enormous weight is off my shoulders! As for eating well, let’s see if I can manage to keep it up even after returning to normal life. Heaven knows, proper nutrition isn’t needed only to fuel thesis writing…Hi Ivonne – If you like sweet and salty things together I think you’ll definitely like this! Are you a fan of Indian food in general? Hi Jini – Thank you, and I hope this met with your mother’s approval! Her version sounds fantastic too – any chance she feels like sharing?Hi Angelika – Thank you, it’s great to be back doing what I *want* to be doing, as opposed to what I *have* to be doing!Hi Kat – If this sounds good you’ll be delighted at just how many forms of chaat there are to discover. This is quite literally just the tip of the iceberg…Hi Callipygia – Welcome and thank you!Hi Suparna – Yes, this chaat was really a miracle food to have around, not to mention that it really was a welcome respite from all the frozen pizzas and cheese sandwiches! Tell me, is ‘chatpata’ a term from a particular region of India?Hi Ilva – Nice to hear from you! Thankfully it’s the ‘home stretch’ now, and somehow the work gets infinitely easier knowing the hard part is over. Forever!Hi Michele – Well, well, if you’ve already got the tamarind paste you’re just a few chickpeas short of a chaat! And I can’t say for sure if it’s good for general brain function, but if you happen to have an unwritten thesis lying around, I would definitely add it to the menu ;)Hi Keiko – Why not? I mean, they were my addition to the recipe in the first place! Let me know what you think.Hi Scott – What, you don’t like chickpeas?? But they’re are so versatile – perhaps you just haven’t found the right recipe to coax out your inner chickpea fan? 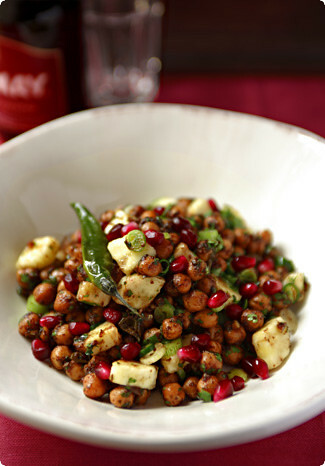 I wouldn’t be surprised if nothing but a bowl of chaat stands between you and eternal chickpea love!Hi Kevin – Thanks! :)Hi Luisa – Aw, so nice to have been missed!Hi Tania – Ah yes, not very ‘eat local’ of me to suggest pomegranate at this time of the year, though strictly speaking it is *never* pomegranate season in Scotland… Ah well, when those ruby-red beauties do make their appearance in Toronto later this year you’ll have to give me your chaat report! :)Hi Bill – Holy cow, that was some lightening fast chaat-making! Thank you for the feedback on all the recipes you tried (and far be it from me to begrudge you for removing the bananas :).Hi Lindy – Oh yes, I’m a big fan of the meal-in-a-bowl too! For me, in fact, the only thing that trumps it is a meal that is entirely prepared in the same bowl in which it is eaten! (Can you guess I’m not a fan of dirty dishes?) This one almost qualifies, but regardless, the taste is definitely worth washing out that extra pan…Hi Tanna – Thank you! And I’m delighted to discover a fruit-in-salad kindred spirit. During those precious few months when fruits are actually ripe and in season here I love nothing more than to find ways of incorporating them into every meal possible.Hi Malka – Sounds like you’ve just invented an Israeli chaat! As for substituting pomegranate molasses for tamarind, I say give it a try. I haven’t tasted them side by side, but my memory says the molasses is quite a bit sweeter than tamarind, and you may have the play with the quantity to get the right balance of sweet and sour, but why not give it a shot?Hi Julie – Welcome, and thank you! If you have any feedback at all about what you’ve tried, please don’t be shy – good or bad, it’s all appreciated!Hi Vineelakrishna – Your pani pooris really do look delicious! I think it’s high time to engage in some chaat-horizon broadening…Hi J – Thank you, it was difficult to be away for so long, though not having the pressure to post was probably necessary to maintain my sanity. I did, of course, reward myself every now and then with a sneak peak at what everyone else was up to… I couldn’t give up everything fun, now could I?Hi Deccanheffalump – Why thank you, and yes, although I’m not sure I remember quite what a hot day feels like, I’m sure this would be perfect ;)Hi Liza – The best of luck to you with writing your thesis! Looking back on it, my advice (and what I wish I had done myself) would be to spend a couple of days cooking up a storm and freeze as much as you can in single-serving portions. That way you might be able to resist some of those quick-calorie-fix temptations I fell victim to…Hi David – No, actually, but had I known there were entire rooms full of this stuff I probably wouldn’t have gotten any work done!Hi Chubby Hubby – Thank you, and tell S that I have all my fingers and toes crossed for her. But I know she’ll make it. Lovely…the red background really makes the color of the pommegranate pop in the photo. Glad to see you back up and runnin! Hi Melissa, I know this post must have been more than a year old, but the readers till send you comments on this. I was browsing thru the latest article of your and I thought you are a Chef or owner of a restaurant and then I read more I came to know you are PhD! !Anyways, This chat you have described has many different variations, my favorite is during the summers in Mumbai when the raw mangoes come in. you cut them in to small pieces, add them in to this chat and it is mind blowing. I hope you try this sometime. Since you don't have a new post, I'm going over your salad recipes for next week's menu. Pomegranates are in season so I'm having the best recipes I can get. Great one as always!